* Atta flour is finely-ground wholemeal (wheat) flour that is used to make the unleavened Indian bread chapatti. ** Substitute with beef or chicken if preferred. Combine flour, salt and sugar in a mixing bowl and mix in the softened butter with your fingers. Add enough liquid to make a fairly soft dough; although it shouldn´t by any means, be sloppy or sticky. (If it is, remedy this by kneading in an extra tablespoon or two of flour until the stickiness disappears.) Flours do differ in dryness, so use the above liquid measurement only as a guide – you may need more or less. Once the dough comes together, knead on a lightly floured surface for 5 – 10 minutes, until it feels smooth and pliable. Place dough in a bowl, cover with a clean, damp cloth and set aside to “rest” for 30 minutes (to reduce the elasticity of the dough and make the puffs easier to roll out and shape). Heat oil in a roomy pan or wok over medium heat. Add the ginger and half the chopped onion, frying for 3 – 5 minutes until onion begins to brown. Add minced meat and cook until it loses it pinkness. Combine the curry powder and water to make a slack paste and add this to the pan, frying it well until mixture is fragrant and the oil starts to separate. Add the ground black pepper. (I like the extra little zing that the black pepper adds but if you wish to keep the filling less spicy, you can omit it. In fact, if you want to make your puffs “children friendly”, you can (drastically) reduce the amount of curry powder to one teaspoon (or not use it at all). Add the potatoes and carrots and cook until tender – about 15 minutes. Season to taste with a squeeze of lime juice and salt to taste. Lastly, stir in the coriander and take pan off the heat. Spread filling out onto a shallow plate to cool. 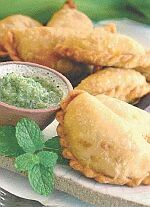 To shape curry puffs, pinch of pieces of dough roughly the size of small limes (ideally they should weigh around 30 g). Roll into smooth balls and using a lightly-floured rolling pin, flatten them into circles roughly 7 cm across – the pastry can afford to be slightly thicker than for regular curry puffs. Place a pastry circle in the palm of your hand and lay a generous spoonful of filling in the middle. Fold the pastry over to form a semi circle and pinch the edges of the dough together to seal, completely enclosing the filling. Either flute the puffs decoratively by pinching the edges at regular intervals with your thumb and forefinger (unfortunately this is not one technique that is easily described in words – you either know how to do this or you don´t!) or press the tines of a fork along the edge. As you make them, lay filled puffs on a lightly floured tray or cloth. Heat oil to a depth of 4 cm over fairly low heat and gently slide the puffs in, frying them until they are golden brown. Keep the heat low as frying the puffs in oil that is too hot results in an unattractive, blistered surface. Drain puffs on absorbent kitchen paper and serve warm.